Christa McCartney is a well known local musician due to the broad extent of her abilities. Christa gained a first class M.A degree, rated as ‘excellent’ in Kodály Music Education (with Conducting) from the Franz Liszt Academy in Budapest , She is a solfege teacher and conductor with a joyful passion for developing the practical and theoretical musicianship of everyone she teaches. She also holds ABRSM diplomas in Singing and Piano and an AmusTCL in musicianship, and is currently pursuing a doctorate in education with the University of Liverpool. 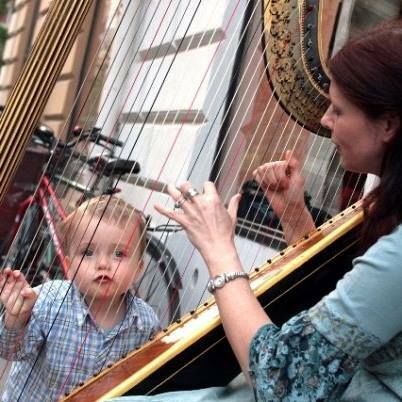 Christa has played celtic and pedal harp since 2002 and has regularly given harp and voice concerts on the IOM, in Hungary and in Switzerland. She has conducted the Northern Sound childrens choir and the Ramsey Choral, run Kodály groups in Douglas and Castletown, given seminars on the Kodály method, been a church organist, run the Saturday morning music workshops in Douglas, run regular harp workshops in Ballasalla, run 'learn to sing' courses for adults who believed they were tone deaf (no such thing of course! ), and taught in both primary and secondary schools as a specialist music teacher. Christa also worked at King Williams College for many years as a voice, piano and music theory teacher.